This series is for the true beginner or for those who are looking to brush up on techniques. 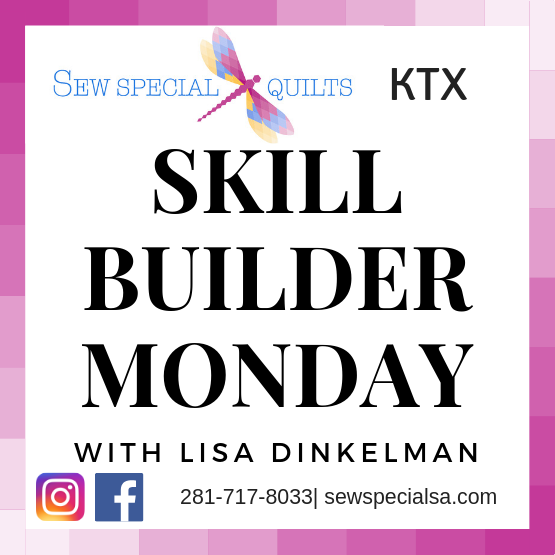 Every First Monday Lisa will host a 3-Hour technique workshop on topics such as Rotary Cutting Basics, Machine Applique, Foundations Paper Piecing, Perfect Borders, and sew many more! Sign up for all or pick and choose. Learn to use your rotary cutter safely and to cut with confidence which will, in turn, improve your accuracy and speed. Make a small lap quilt with the fabrics you cut during class. NO sewing machined needed for this class. Perfect pressing, perfect points - perfect patchwork! Learn to accurately measure your 1/4" seam allowance and how to press and pin your seams to ensure consistency and perfect points every time! Sewing machine required. Learn machine applique, or brush up on your skills and learn some new tricks! We will cover everything from recommended supplies to different stitch options. Foundations piecing is a great way to learn how to quilt because you don't have to cut precise fabric pieces. In addition, sewing the pieces on a paper foundation ensures precision. Learn tips and tricks to achieve perfect hand quilting. You'll also learn how to join quilted blocks together to keep your hand quilting projects portable and easy to work with. Not confident about measuring and sewing borders? Learn about different types of borders and how to sew them with accuracy. Bring a quilt if you want hands-on help. An introduction to a quilt as you go technique that eliminates the need to do the quilting in the end. Make a small quilt with your blocks from class, or keep going and go large! Wrap fabric around paper to make crisply formed shapes to be sewn together by hand. A relaxing way to sew, and portable, too! NO sewing machine needed for this class. Learn a quick and easy Cathedral Window machine-sewn technique to make a quick, yet impressive, wall handing. In this workshop, sample my favorite hand applique technique. Plus, we will discuss others that you may want to try on your own. Learn some tricks for making hand applique a breeze. We will try different shapes that will allow you to master curves and getting sharp points. A stress-free introduction to free-motion on your sewing machine. Experiment with different beginner-friendly free-motion designs to make a small sampler. Use a darning foot on your sewing machine to add texture and interest to your quilts. Not confident about binding your quilt? Learn about different types of binding. Bring a quilt if you want hands-on help. If not, we'll provide a small quilt kit to practice on. An introduction to Sashiko Japanese hand quilting, typically done with white thread on blue fabric. Ideas will be provided on how to turn your sample pieces into a small quilt or coasters.